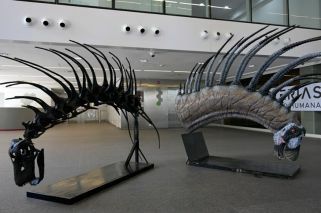 Herbivore that fended off predators with a row of spines running along its back and lived 140 million years ago unveiled in capital. A herbivorous dinosaur that fended off predators with a row of spines running along its back and lived 140 million years ago has been found in Patagonia. The discovery of the new species of dicraeosauridae, christened "Bajadasaurus pronuspinax," was revealed in scientific journal Nature. A reproduction of its spiny neck was exhibited in the Cultural Science Centre (Centro Cultural de la Ciencia) in Buenos Aires. "We believe that the long and sharp spines – very long and thin – on the neck and back of Bajadasaurus and Amargasaurus cazaui (another dicraeosauridae) must have been to deter possible predators," said Pablo Gallina, an assistant researcher at the state council of scientific and technical investigations (CONICET) and Maimonides University. "We think that had they been just bare bone structures or covered only by skin, they could have been easily broken or fractured with a blow or when being attacked by other animals," he added. "These spines must have been covered by a keratin sheath similar to what happens in the horns of many mammals." Amargasaurus cazaui lived in the South American continent around 15 million years after Bajadasaurus and both species were found in the Neuquén province around 1,120 miles (1,800 kilometres) south of Buenos Aires.